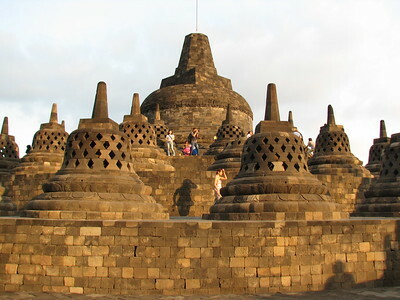 The Borobudur Temple Compounds is a ninth century Buddhist temple complex. It was built on several levels around a natural hill. Borobudur is built as a single large stupa, and when viewed from above takes the form of a giant tantric Buddhist mandala, simultaneously representing the Buddhist cosmology and the nature of mind. The foundation is a square. It has nine platforms, of which the lower six are square and the upper three are circular. The upper platform features seventy-two small stupas surrounding one large central stupa. Each stupa is bell-shaped and pierced by numerous decorative openings. Statues of the Buddha sit inside the pierced enclosures. The site was rediscovered in the 19th century, and restored in the early 20th. In 1973 a major renovation took place that was funded by UNESCO. Two smaller Buddhist temples, Pawan and Mendut, are part of the designated area too. Together with the Taj Mahal and Angkor, the Borobudur is probably one of the three most iconic WHS. I visited it at sunset. At first I was amazed that the monument cannot be seen from the road - I had always thought that it is very big? Also, when I finally got it in my view, it looked much less spectacular than I had imagined. Most of the stones are dark from exposure to the elements. I climbed the monument by going round clockwise at every level. That's when the site certainly started to grow on me. The sheer number of carvings into the walls, and their little details, kept me interested layer after layer. At some points there are whole reliefs, like paintings, displaying parts of a boddhisatva's life or a historic scene. The top, the central stupa surrounded by little stupas, is where all the visitors congregate. It looks a completely different place than the levels below. It's a fine spot to relax after the climb, and to contemplate all that you've seen underway. There are great views over the surrounding fields and mountains too. I visited this WHS in August 2018. Borobodur is Indonesia's most visited site and is known as the world's largest Buddhist archaelogical site. That said, I must confess that what impresses most is not its size but its architecture and the quality of its reliefs. Borobodur is built in the form of a step pyramid with an important focus on symbolism and cosmology. It is built as a single large stupa with 9 platforms, the lower 6 being squarish and the remaining upper 3 being circular. It is symbolically divided in 3 realms of Buddhist cosmology: Kamadhatu (the world of desires), Rupadhatu (the world of forms), and Arupadhatu (the formless world) and the reliefs' themes follow these 3 realms. Unfortunately, these magnificent reliefs are often overlooked or ignored nowadays as most visitors rush to the top platform to see the 72 photogenic small bell-shaped stupas surrounding the larger central stupa and the panoramic views especially at sunrise and/or sunset. Don't get me wrong, the views from the upper platform at sunrise and sunset are sublime and worthwhile. They can be less noisy and crowded then other sites famous for sunrise/sunset such as Bagan or Angkor Wat to name a few as there is no specific iconic building/temple or spot were everyone gathers. Moreover there are two huge volcanoes and 3 uncovered small stupas with Buddha statues so this helps. 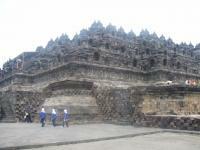 However, in ancient times pilgrims to Borobodur circumambulated the narrow corridors on each level in slow succession. Keeping the main wall of the monument always to their right, meditating and praying, pilgrims used to trace a slow spiritual progress to the summit, achieving an ever purer state of mind, progressively detaching themselves from the miseries of the world. Borobodur's architecture reinforces this process as the lower levels are labyrinthine, while the higher ones are gradually open culminating in Nirvana among several Buddha statues. 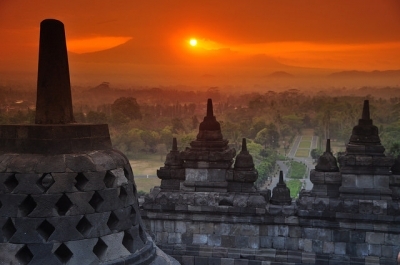 When viewed from above, Borobodur has the shape of a giant tantric Buddhist mandala. Of all the WHS I've visited, Borobodur has the most impressive and detailed reliefs. They truly are outstanding not only for the sheer quantity and their incredible detail but mostly because they were sculpted out of hard lava stone and not out of limestone or sandstone as in Sanchi or Hampi in India. Even though due to erosion and volcanic ash, their colour is now mostly grey or black, it is believed that they were once covered with plaster and painted in different colours. To me, Borobodur's OUV truly lies in the quality and variety of its carvings and reliefs. Moreover, Borobodur is an outstanding example of how UNESCO can help conserve such an incredible site. In 1975, over a million stones were painstakingly removed, cleaned, treated, catalogued and put in place again in one of the world's largest jigsaw puzzles. In a way this reminded me of other massive projects at the time such as those at Abu Simbel in Egypt. As recently as in 2010, after Mt Merapi's eruption, more than 55,000 stone blocks comprising the temple's structure were dismantled to restore the drainage system, which had been clogged by slurry after heavy rains. In 2012 special chemical and microbiological treatments were applied to the stones to help conserve the reliefs. Eruptions and earthquakes are a constant threat and probably the main reason why such a wonder was abandoned and almost forgotten till relatively recent times. I spent 2 nights in Borobodur and had initially booked myself a room at the Manohara Hotel within the temple compound. To my surprise, a few weeks before my arrival when I was more concerned because of the strong earthquakes shaking Lombok and the Gilis, the hotel contacted me that it was closing down as it was to be converted into a Buddhist meditation centre, a bit like similar structures in Bodhgaya, Lumbini, Sarnath, etc. I booked in a different hotel but got discounted rates for the sunrise, sunset and normal entrances for the inconvenience. I was lucky enough to be able to enjoy excellent weather during both sunsets and sunrises (one of which I took in from far away from Punthuk Setumbu - only worth it if you have extra time to spare). Sunrise was my personal favourite because there were less people but mostly because of the two huge volcano silhouettes that appeared before us as the sun rose, only to disappear as the sun rose further. Just after sunrise was also the best time to explore the lower platforms and reliefs almost alone as most return to their hotels for breakfast. I was so amazed by the reliefs that I decided to skip breakfast and kept exploring the temple till sunset, admiring the exquisite reliefs at different times of the day with different sunlight. And here is my only disappointment with the way Borobodur is managed. Unfortunately, like several other top WHS worldwide, not only are the entrances prices expensive but every excuse is used to rake more money out of visitors. Being quite close to Prambanan and Yogyajakarta, most visitors just visit the site en route and only stay for sunrise and possibly a couple of hours and then proceed to Prambanan for sunset. Unlike, Angkor Wat for example were there are different tickets for cumulative days, there are only normal day tickets and a combination ticket for Borobodur and Prambanan on the same day. Nothing wrong here. But was really annoying, as was the case in Registan, Uzbekistan, was that you have to pay twice if you intend to revisit in the late afternoon for sunset or even if you stay from sunrise (as I did). The result is that at sunset, the few security guards start chasing those who try to avoid paying twice (and don't have the appropriate sticker displayed on their shirt) and ruin the atmosphere for the rest of the visitors. Surely, a better system could and should be found. The Manohara Restaurant/Bar was still open when I visited and it was the closest place to buy something to eat and drink. The onsite museum is more like an incredible graveyard of misplaced stones and reliefs from the temple. The lowest platform was added after construction so as to bolster the structure and the majority of the reliefs are now hidden. This can be clearly seen at the southeast corner of the temple were some of the reliefs have been revealed. Just after going in through the normal (not sunrise) entrance, there is a black marble UNESCO inscription plaque. All in all, Borobodur is truly one of the best WHS on the list and like the majority of Indonesia's WHS, a top WHS that shouldn't be missed. Apart from Bali, Borobudur is maybe the most well-known cultural site of Indonesia, its iconic image is widely used to represent Buddhism or exotic of Southeast Asia which turned Borobudur to be a must see place in this country. It was a dilemma that should we stay near Borobudur and join the famous sunrise tour or not, but since we visited Indonesia on monsoon season which normally has raining in the early morning and late afternoon, so we decided to stay in the city of Yogyakarta instead and made a day trip instead. On the late showering morning, our driver took us to Borobudur, when our van left Yogyakarta’s city limit the rain stopped and finally we could ensure that our visit will be dry. The first sight of Borobudur was a big surprised for us as we expected Borobudur to be gigantic likes Great Stupas in Anuradhapura of Sri Lanka, but the structure is still big enough and not totally destroy our imagination. The size of Borobudur reminded me lesser complex of Khmer Civilization of Angkor Wat or Pyramid of Maya in Mexico. When we approached near Borobudur, the blackish of the whole structure made we felt a bit bore on its overall visual design. The colors of tourists’ dresses who walked on Borobudur’s upper area were far more eye-catching! Then our guide showed us the first floor of the whole complex which full of beautiful cravings depicting stories of Buddha and many Buddhist legends. The quality of art is magnificent, really beautiful and in the same par of great mural of Angkor and Ellora. When we went higher and higher in each floors, more beautiful cravings could be seen including lovely Buddha statues and small stupas. One of the impressive structures are the four gates of each floors which seemed very fragile and prompted to collapse by just small push, but actually very strong structures. One of the unbelievable thing we had in Borobudur was that during we saw those cravings on lower floors, we had not seen or encountered any tourists at all, and when we reached the top floor, we finally met all fellow tourists. To be honest for art quality, the top floor were quite boring with only two types of stupa, the Buddha statues inside stupas were hard to see except the one that seem to be intended not to be restored in order to show the Buddha image which became a must shot for souvenir photographs. However, the view of surrounding valley and the view of stupas were breathtaking and really photogenic. After walking around on the top floor, we decided to climb down, our guide explained to us that since the beginning of construction, the weight of the whole Borobudur complex made the whole structure to collapse inside as there is no strong fundamental underneath it. Ancient engineers had to build extra stone platform around Borobudur as the stone ring in order to keep the whole structure intact while hidden the lowest floor mural craving which representing the underworld, fortunately when archaeologists restored Borobudur, they decided to leave some part of this stone platform opened and show the cravings. It was a hot and humid but lovely day to see this beautiful World Heritage Site of Indonesia. While Borobudur is not exactly what we expected, the complex is indeed beautiful and have outstanding value that deserved to be one of top three must see cultural historical sites in Southeast Asia apart from Angkor and Bagan. Together with the equally impressive Phambanan and Sultan’s Kraton Palace complex, Yogyakarta is a worthwhile destination. Also the food here is quite amazing from Sultan royal cuisine to street foods, and the local special delicacies like fried chicken, Gudeg Jogja or Jackfruit dried stew and Bakpia, bean filled pastry are really delicious and simply the must. The Borobudur had been on my top wish list to see WHS for a long time. Finally in May 2016 it was time. I visited most of the Indonesian WHS. Not going into the history but a few practical things. I suggest going on a sunrise tour. This is simply amazing (see photos on the link). After the sunrise you have time to explore the complex; that's the time the groups come in too. So you have less tourists. Much better for photography. The sunrise was amazing. First the clouds turn purple-orange-red when the sunrises, but still behind the Merapi volcano. Then it gets boring for 20 minutes; don't leave! Then, you will see the sun coming from behind the Merapi and the sky again turns orange-magenta! It's magical! See my photos on the link. THis is one of the most gorgeous sites in the world, particularly during sunrise. I went three mornings in a row- its irresistible - with the smoke of an active vulcano, the Mirapi, in the distance, and the gog over the tropical landscape of central Java, with hundreds of serene Buddhas watching - glorious! One of the most beautiful WHS. So grand and full of lovely details in its wall. One of the Ancient Wonders of the World, not to be missed in life time. A wonderful creation with beautifully architectured with a blend of true culture. The Borobodur Temple complex is one of the greatest monuments in the world. It is of uncertain age, but thought to have been built between the end of the seventh and beginning of the eighth century A.D. For about a century and a half it was the spiritual centre of Buddhism in Java, then it was lost until its rediscovery in the eighteenth century. The structure, composed of 55,000 square meters of lava-rock is erected on a hill in the form of a stepped-pyramid of six rectangular storeys, three circular terraces and a central stupa forming the summit. The whole structure is in the form of a lotus, the sacred flower of Buddha. This coming 26-29 september 2004 Indonesia Tourism Board along with Event Organizer Pacto Covex are organising a special event called Royal Tourism Indonesia Mart & Expo [TIME] 2004 at Yogyakarta, the city of Borobudur. Royal TIME 2004 is a strategic international event that will help showcase Yogyakarta and Java to the international tourism market. So, Selamat Datang!, welcome to Yogyakarta! Hope you enjoy your stay there and trust you will enjoy TIME 2004 and the Javanese way of life. Finally, you are guaranteed to receive warm hospitality and a genuine welcome from the people of Yogyakarta and are proud to show their heritage to the world. Living in Indonesia and travelling around to see some of the volcanoes such as Krataua and Merapi were always great. But I would have to say that the trip I went on to the Borobudur Temple is one I remember the clearest. It is a really good idea to get a local tourist guide to go around the temple area with you so you really get to learn what the place is all about. The Borodudur Temple was discovered by a dutch general in the 19th century. With dutch funds it has been reconstructed. Due to terrorist attacks in the 1990's it is still under construction. 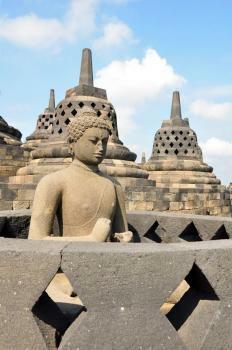 The Borobudur is a breathtaking experience. It's a must to visit the biggest temple under the equator. Terrorist Attacks: Wiki: "On 21 January 1985, nine stupas were badly damaged by nine bombs." Sir Stamford Raffles: In 1814 Raffles was the Lieutenant Governor of Java (which Britain had captured during the Napolenic wars) and heard about a huge ruined temple on the island. He ordered its clearance and visited it on May 18 1815. Raffles's book on Javan history is the earliest written reference for the name "Borobodur" which is believed to refer in part to a nearby village. Foreigner prices: Those holding KTP (Indonesian ID) or KITAS (foreign resident permit) pay IDR 40k, while foreigners pay USD25.